Lift-off Hinge leaves are constructed of 6061-T6 aluminum for the perfect balance of strength, light weight and corrosion resistance. The steel pivot pin is coated with a thermosetting modified acrylic to provide long-term corrosion protection and wear resistance. 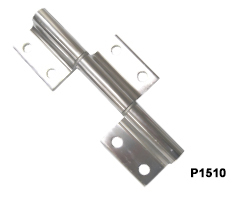 They are ideal for smaller swing door or tool box applications and allow you to lift the door off the hinge with ease. Three-piece Hinges are very secure. Once bolted to the frame, pins cannot be removed because of a flange between the leaves. The pin cannot be unscrewed or pounded out and they are also corrosion resistant due to thermosetting modified acrylic coating. 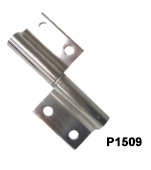 Constructed of 6061 aluminum, these hinges are both light weight and very strong.